November 2008 marked the 200th anniversary of the death of Boatswain - Lord Byron's Newfoundland, famous for the poem inscribed on his memorial in the grounds of Newstead Abbey. The opening words of the epitaph originally thought to be entirely the work of Byron are now thought to have been written by his friend John Cam Hobhouse M.P. Although the inscription on the monument states Boatswain's date of death as November 18th 1808, Byron wrote to his friend Francis Hodgson on that date stating "Boatswain is dead! he expired in a state of madness on the 10th, after suffering much, yet retaining all the gentleness of his nature to the last, never attempting to do the least injury to anyone near him." Boatswain died of rabies, having been bitten by a rabid dog while following his habit of accompanying the post boy into Mansfield. Byron initially did not appear to have recognized the condition. In the 1833 edition of Thomas Moore's book, Letters and Journals of Lord Byron, Mr Moore wrote: "the poor animal having been seized with a fit of madness, at the commencement of which so little aware was Lord Byron of the nature of the malady, that more than once, with his bare hand, he wiped away the slaver from the dog's lips during the paroxysm." In 1808 rabies was widespread in England with frequent deaths in both the animal and human population. An effective vaccine was not developed until the 1880s and with the introduction of quarantine, rabies was eradicated in the UK in 1902. After this date there were occasional outbreaks such as in 1945 when 150 dogs in Devon and Cornwall were infected as a result of the illegal import of a rabid dog into Devonport from wartime Europe. The Boatswain memorial is a tribute to Byron's affection for his Newfie. It is placed in the ruins of the Abbey, close to where the altar would have once stood. Although deep in debt Byron commissioned the impressive marble monument for his dog, the only building work which he ever carried out during his time at Newstead Abbey. Having spent several years trying to sell the property at auction, he finally achieved this in 1817 when it was sold to Thomas Wildman who had been at Harrow School with Byron. In 1861 the Abbey passed to William Webb, an African explorer and friend of David Livingstone, and finally to Nottingham Corporation in 1931. Having sold the Abbey Byron left the Country with the proceeds, never to return. In 1811 Byron executed a will, and against the advice of his Solicitors, he requested that he should be buried in the tomb with Boatswain. He stipulated that he should be buried, "without any burial service whatsoever, or any inscription save my name and age." Also to have the honour of joining them in the tomb was his manservant, Joe Murray. Joe however appeared to be less than impressed with the idea. He didn't mind the prospect of being buried with Byron, but didn't like the idea of "Lying alone with the dog." As things worked out his fears were fully justified. From an early age, Byron had a great fondness for animals and his homes always included a large collection of pets. During his lifetime, in addition to his dogs he owned, a bear, a fox, four monkeys, a parrot, five cats, an eagle, a crow, a falcon, five peacocks, two guinea hens, an Egyptian crane, a badger, three geese, a heron, a goat with a broken leg and many horses. All except the horses resided indoors at Byron's homes in England, Switzerland, Italy and Greece. There is an interesting story about the bear who appears to have been a playmate for Boatswain. While a student at Cambridge, Byron was annoyed that the University rules banned him from keeping a dog in his quarters. True to character, he installed a tame bear instead. There being no mention of bears in their statutes, the college authorities had no legal basis for complaining. In one of his letters Byron cheekily suggests that the bear should sit for fellowship of the college. Byron died at a young age on 19 April 1824 of a fever, having been in poor health for some time, and not helped by the practice of bleeding carried out by his doctors at that time. Having supported Greece in its war with the Ottoman empire, he became a national hero in that Country, and his heart was buried under a tree in Greece. Byron's remains were then embalmed and sent back to England for burial, accompanied on the ship by his faithful Newfie, Lyon. The body was laid at state in London for two days, but the Deans of Westminster Abbey and St Pauls refused to take it because of his notorious moral reputation. His request to be buried with Boatswain was denied, Newstead Abbey being in new ownership. He was therefore buried a few miles away in the Church of Saint Mary Magdalene, Hucknall, in the family vault. Pictures of Boatswain and Lyon are still on display at Newstead Abbey, although the portrait of Boatswain looks more like a border collie. A better picture of Boatswain (reproduced right) shows him in typical Landseer colouring. 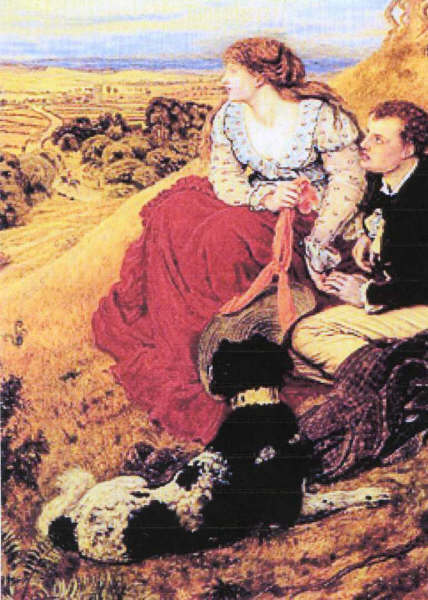 This is on display at nearby Annesley Hall, home of Mary Chaworth, the first of Byron's many lovers, and depicts the three of them looking out from Diadem Hill, from which there was once breathtaking views of the Hall. Recent DNA analysis has revealed some interesting information. In the days before photography it was the custom for lovers to exchange a lock of their hair. Analysis of over a 100 samples sent by Byron to his various fans and lovers shows that most of these came from a dog, in all probability, BOATSWAIN. 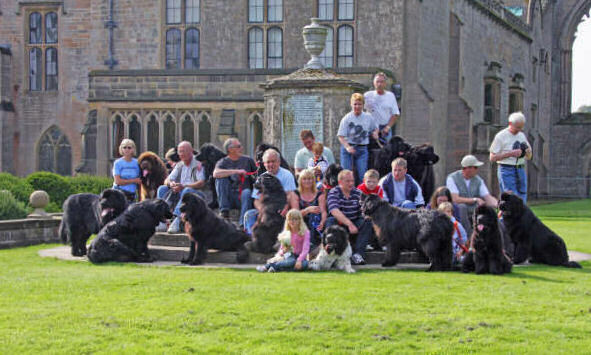 To celebrate the 200th anniversary of the death a Boatswain, a gathering of Newfies and their owners was held at Newstead Abbey in September and a posy of flowers laid on the monument. A fitting tribute to one of the most famous Newfies in our history.